NASA today unveiled an ambitious blueprint for returning American astronauts to the moon by 2018 using new rockets based on shuttle propulsion technology and a new reusable crew vehicle Administrator Mike Griffin described as "Apollo on steroids." The new architecture is the result of a 2004 Bush administration directive to complete the international space station and retire the shuttle by 2010; to develop a new manned spacecraft to replace the shuttle that could deliver crews to the station and, eventually, to the moon for extended missions. The long-range goal is eventual manned flights to Mars. "We believe this architecture, which is the product of an intensive summer of work by hundreds of folks here at the agency, achieves those goals in the most cost-effective, efficient manner that we could do it," Griffin told reporters. "It's within the available budget, without asking for new money, and does so in as timely a manner as we could discern." He described the new initiative as "the best mission statement NASA has had in 40 years." But it will not be cheap. Griffin said the total cost of the program, from now through the first moon landing around 2018, will be roughly $104 billion, or about 55 percent of the cost of the Apollo moon program in inflation-adjusted dollars. While Congress has been generally favorable to the idea of a new moon-Mars initiative, many have questioned whether lawmakers will fully fund the program given the demands of Hurricane Katrina and the cost of the ongoing war in Iraq. But Griffin said NASA is here to stay and that space exploration represents a long-term investment. "We're talking about returning to the moon in 2018," he said. "There will be a lot more hurricanes and a lot more other natural disasters to befall the United States and the world in that time. I hope none worse than Katrina. I've been down there ... and it's just devastating. But the space program is a long-term investment in our future. We must deal with our short-term problems while not sacrificing our long-term investments in our future. When we have a hurricane, we don't cancel the Air Force; we don't cancel the Navy. And we're not going to cancel NASA." He said NASA's Michoud external tank facility in New Orleans and the Stennis Space Center near Bay St. Louis, Miss., where shuttle main engines are test fired, will both play critical roles in the new exploration initiative, providing "thousands and thousands of real jobs, not WPA work, not reconstruction but strategically important work" to residents of the hurricane-ravaged Gulf Coast. The centerpiece of the new initiative is the so-called Crew Exploration Vehicle, or CEV, which will carry up to six astronauts to the international space station or some 25 metric tons of cargo when launched in an unmanned configuration. The capsule would be launched atop a single shuttle solid-fuel booster equipped with an upper stage powered by a shuttle main engine. Like the old Apollo command module, the new CEV would feature escape rockets to pull a crew away from a malfunctioning booster. 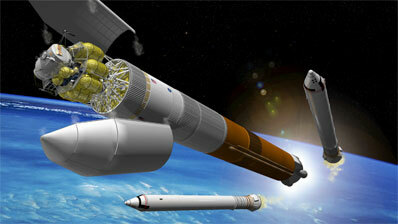 NASA hopes to launch the first CEV by 2012, minimizing the downtime after the end of the shuttle program in 2010. But the schedule could stretch out depending on how funding evolves. "It is very Apollo like," Griffin said. "Think of it as Apollo on steroids. Currently, we're looking at a five-and-a-half meter base diameter compared with a 3.9 meter Apollo diameter. 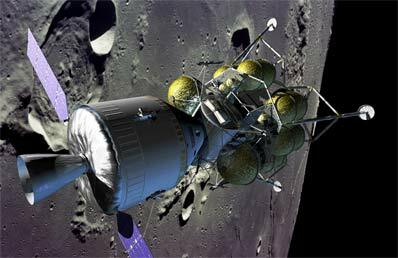 ... We're talking about a CEV capsule that weighs about 50 percent more than the Apollo command module, but can carry twice the number of people, can sustain itself for six months in lunar orbit, offers quite a lot more capability. "We're talking about a design that is fundamentally reusable. It must have the capability in a survival mode to land on either land or water. We are currently baselining a land landing (at Edwards Air Force Base, Calif.), but ultimately that is up for grabs." Heavy cargo, including the craft that will carry future CEV crews to and from the surface of the moon, will be launched on a new generation of powerful unmanned rockets utilizing two extended shuttle solid-fuel boosters, a hydrogen-oxygen first stage built around an extended shuttle external fuel tank and five space shuttle main engines and a new upper stage built around one or more main engines. The solar-powered CEV would rendezvous with the lunar lander spacecraft in low-Earth orbit. Four astronauts then would fly to the moon and descend to the surface in the lander for a one-week stay, leaving the CEV alone in orbit. After completing their initial four-to-seven-day mission, the astronauts would blast off, rendezvous with the CEV and return to a parachute landing in the western United States. Griffin said the CEV offers major improvements over the Apollo design: Twice the number of crew to the lunar surface - four people instead of two - and "at least double the amount of time" on the surface. "We're talking seven-day missions being available even on the first returns back to the moon," Griffin said. "So therefore, four times the amount of lunar surface crew hours. 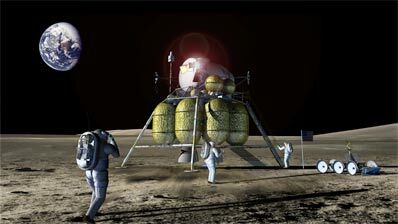 This architecture provides global lunar surface access. Apollo was limited to roughly equatorial regions. Scientists have interest in regions on the moon that expand well beyond equatorial regions and this system provides that, together with anytime return to Earth, which is crucial. It allows us, but does not require us, to establish a permanent human presence on the moon while preparing for Mars and beyond." Two moon flights per year are currently envisioned, with the prospect of extended six-month stays a real possibility. 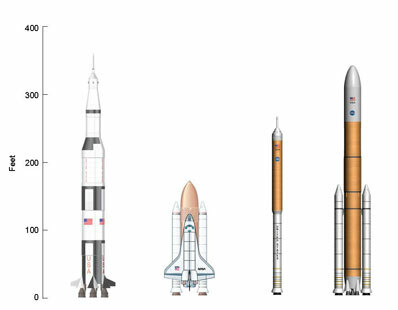 By utilizing existing shuttle propulsion and support infrastructure at the Kennedy Space Center, NASA hopes to save money compared to what a totally new design would cost to develop and launch. And early estimates show the CEV would be much safer than the shuttle fleet, with the odds of catastrophic failure on the order of 1-in-2,000 compared to 1-in 220. The CEV "can carry fewer than six crew and can carry with them pressurized cargo, up to several thousand pounds depending on how many crew one wishes to have with them," Griffin said. "It can function completely autonomously, carrying up to about 7,000 pounds of pressurized cargo and of course, can then come back and be reused. The service module in concert with the crew launch vehicle can carry unpressurized cargo up to again, the payload of the vehicle is around 25 metric tons. "This system, with each launch, places in orbit the same net useful payload as does the shuttle system, in fact a little more, some 25 metric tons in a station-compatible orbit. What it does not do is to combine crew and cargo for each launch. So if we need to launch cargo, we do that. If we need to launch crew, we do that. If we need to launch some reasonable mix we can do that. "I think of it as being like your car. It has a trunk and it has a glove compartment and they're available. If you need really heavy cargo moved around, you hire a moving van. This system provides all of those." President Bush first announced a sharp change in direction for NASA during a speech at agency headquarters Jan. 14, 2004. The plan owes at least part of its heritage to the Columbia Accident Investigation Board, which concluded NASA could not safely fly the space shuttle beyond 2010 without a major recertification review. The Bush plan called for NASA to begin launching unmanned probes to the moon within just four years to map resources and refine knowledge about the harsh lunar environment that will face astronauts making long-duration stays. Space station research will be re-focused almost exclusively on life sciences as part of what amounts to a crash course on learning how to counteract the harmful physiological effects of weightlessness. Knowledge gained from station research, development of the new Crew Exploration Vehicle and the infrastructure needed to support long duration moon missions, the president said, will pave the way for eventual flights to Mars and beyond. "Today we set a new course for America's space program," Bush said. 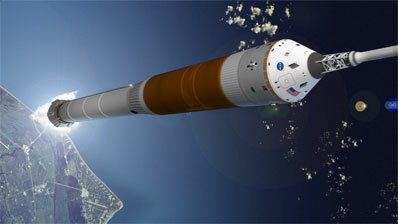 "We will give NASA a new focus and vision for future exploration. We will build new ships to carry man forward into the universe, to gain a new foothold on the moon, and to prepare for new journeys to worlds beyond our own." The original plan called for Congress to boost NASA's budget by an additional $1 billion over the next five years - an average of $200 million per year - to help kick-start the new initiative. Another $11 billion was to come from reallocating money already in NASA's projected budgets by restructuring or eliminating programs and initiatives that aren't consistent with deep space exploration. The president's plan would increase NASA's budget by 5 percent per year over the next three years and then at a modest 1 percent or less per year for the following two years. The bulk of the money to pay for the new initiative would come from funds freed up by the retirement of the shuttle and completion of the international space station.